Gowan Leasing is part of the Gowan Group of Companies which has over 30 years’ experience in the motor industry. 2Cubed were delighted to take on the project of creating a website for Gowan Leasing that not only has a visually beautiful bespoke design but also effectively conveyed clearly their excellent leasing options to all. 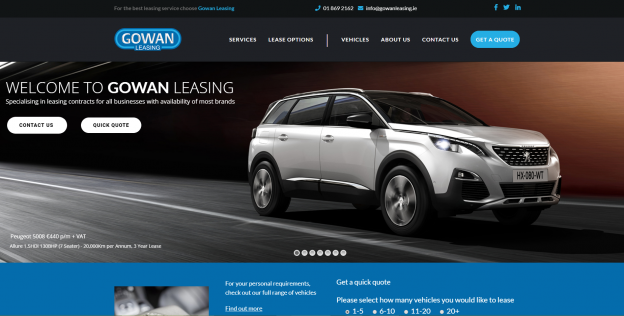 The website gives users the perfect user experience as the website is full of information on Gowan Leasing’s products & services and is displayed in a clear and visually informative manner. Gowan Leasing offer Contract Hire and Fleet Management services and pride themselves on having a high level of expertise within the passenger and commercial vehicle sector. Gowan Leasing works with your business to deliver expert independent advice on cost reduction, fleet management, finance solutions & procurement strategy. Gowan Leasing focus on the most effective methods of managing Risk Reduction and the vehicles total cost of ownership taking into account your business needs. On the Gowan Leasing website you will not only be able to view their services, leasing options and vehicles but you also will be able to use their get a quote option to receive a quote quickly. 2Cubed were delighted to create this brand new bespoke website for Gowan Leasing. If you too are looking for Web Design to match your company’s ambitions and make it a reality then get in Contact today and we will do the same for you. This entry was posted on January 23, 2019 by admin.